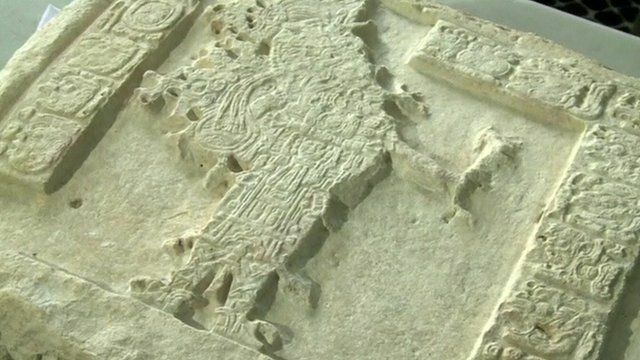 Guatemala dig uncovers Mayan artefacts Jump to media player Archaeologists working in northern Guatemala uncover three well-preserved Mayan panels dating back around 1,400 years. Joy as Roman tombstone unveiled Jump to media player The moment archaeologists got a first glimpse of a Roman tombstone found during an excavation in Cirencester has been captured by a BBC camera crew. Ancient Mayan city found in jungle Jump to media player Archaeologists find the ruins of an ancient Mayan city hidden in the rainforests of eastern Mexico. Working Lives Athens: Archaeologist Jump to media player Six people from very different backgrounds in Athens talk about their lives. Despite having her salary reduced by a third, archaeologist Chara Charami loves her job. Skeleton 'may be real Mona Lisa' Jump to media player Archaeologists unearth a skeleton in a rare state of preservation in Florence which they believe may be a crucial step towards unravelling the mystery of the Mona Lisa. Riches found in ancient Mayan tomb Jump to media player Archaeologists in Guatemala say they have found one of the oldest Mayan tombs ever uncovered. Archaeologists working in northern Guatemala have uncovered three well-preserved Mayan panels dating backing around 1,400 years. The panels display ancient hieroglyphics that provide insights into the civilisation's royal traditions along with a stone image of a king. The priceless artefacts have been moved to Guatemala City for further research. Marcelo Canuto, co-director of La Corona Archaeological Project, describes the importance of the find.